Finally, a trip to the TestKitchen that warrants a blog post! 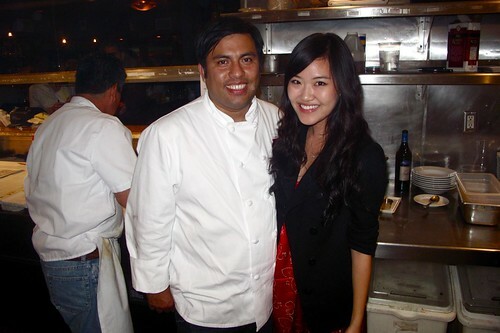 Ever since I had Ricardo Zarate's cooking at the BreadBar last year, I've been thinking about him. Not in a weird, creepy way, but in an admiring, appreciative way. First of all, he not only introduced me to Peruvian cuisine, but also made me love it. Secondly, the man is just the nicest man I've ever met in a kitchen, not to mention extremely talented--obviously. This past year I kept mentally willing Mo-Chica, Ricardo's contemporary Peruvian restaurant, to be closer to the Westwide. Obviously it didn't happen, and I still haven't made it over there. 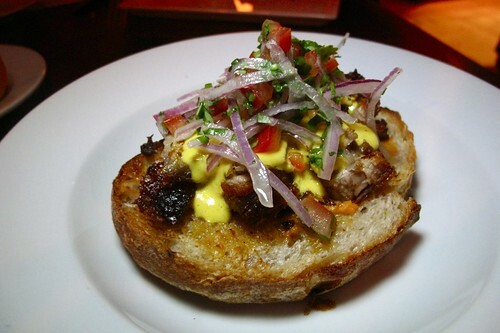 However, the TestKitchen is about as close to where I live as one could hope for, and the upper floor of the building is about to be Zarate's permanent home--a restaurant focusing on Peruvian skewed meat to be named Anticucho. Let's just say I'm pretty excited for some skewered meat. Don't know what TestKitchen is? Check this out. 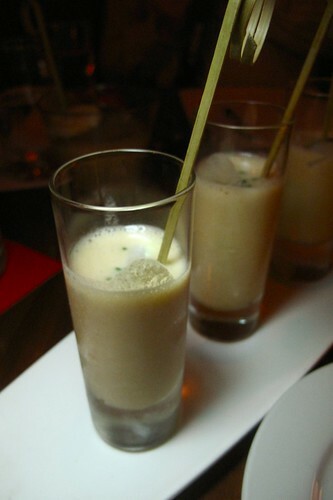 A skewer of perfectly "ceviched" scallops were hidden in the briny leche de tigre--the liquid from the ceviche. After getting the scallops off the skewer, I chased it with the rest of the liquid in the little shot glass. This is a shot I'd like to do over and over again. I've yet to meet a spot prawn I didn't like. 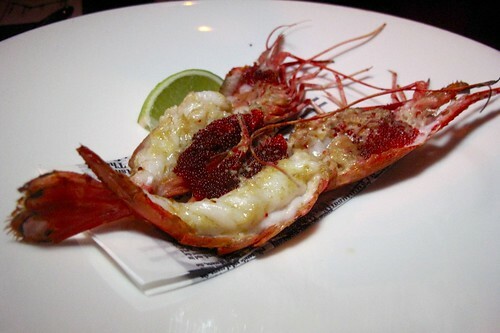 I'd like to meet this spot prawn over and over again. From the head, to the tail, to the roe, the entire thing was delicious. The yuzu kosho added a spicy heat to the sweet meat and roe. There was a nice bite and meatiness to each slice of skewered beef heart grilled to a smokey perfection over an open Japanese charcoal grill. 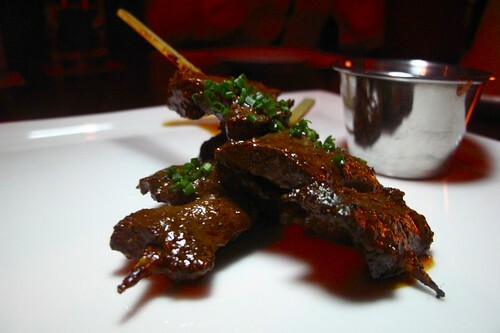 The rocotto sauce, bright crimson red, added a dimension of freshness to the typical beef heart anticucho. Smokey, crispy bits of fatty pork grace the top of a rustic slice of bread, and although tasty, it was a little too filling for me as a bar bite. There was too much bread to it for me. Thankfully, this was the last of the bar bites. These smelled a lot sweeter than they ended up being. Thank god for the awesome buttery foie gras and sweet marmalade/compotes because these little balls of bread were a little dry. However, the accompaniments were very good. I detected a hint of cinnamon to the fig compote that I really enjoyed. The soup was rather unremarkable to me. Granted it had a velvety smooth mouth feel, but taste-wise it was like a little one-dimensional for me. 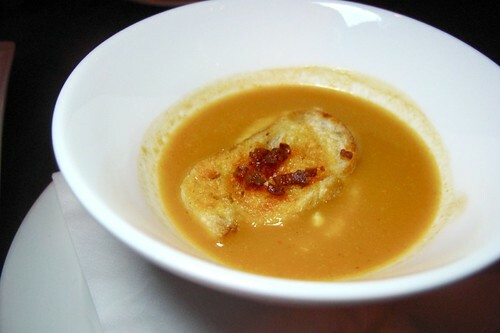 Even the little sprinkling of chorizo on the crouton didn't add much. It just tasted like red bell peppers blended with chicken stock. 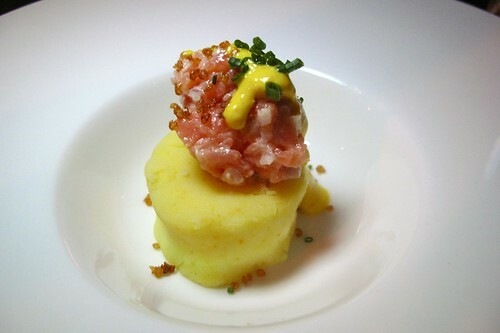 I've had Ricardo's causa at his Hatchi dinner, and I remember absolutely loving them. This time around, it was even better than I remembered. The causa was not only plated so much more sophistically (I thought those colors were gorgeous together in that stark white plate), but also more complex in flavors and textures. The small cubes of salmon were lightly smoked, and a sprinkling of crispy quinoa added a crunchy texture to the smooth, rich potatoes. 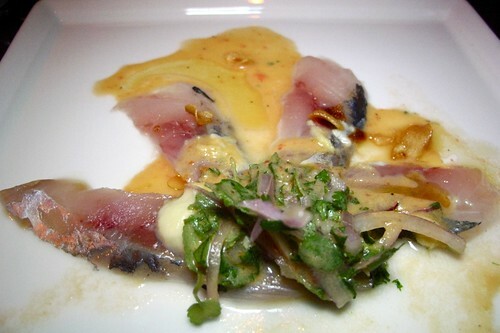 The mackerel, without doubt, was very fresh, but it was the raw red onions, crispy garlic bits, and cilantro sprinkled on top combined with the sauce of aji amarillo, ginger, and sesame oil that really took the fish to another level. The octopus was also grilled on the Japanese grill, therefore it had that same lovely smokey flavor. Unfortunately, I wasn't a big fan of the texture of it. 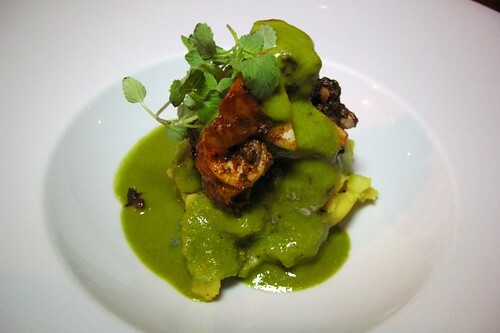 It was kind of dense, though tender, and without any kind of chewiness I like to associate with octopus. The tofu jalapeno chili sauce, however, was very interesting. I thought it was a little on the acidic side, but the dish definitely grew on me as I ate it. To me, this was upscale, stick-to-your-ribs, comfort food. It something that I could crave on a cold, rainy day. The lamb rib literally fell off the bone the second I barely touched it with my fork. 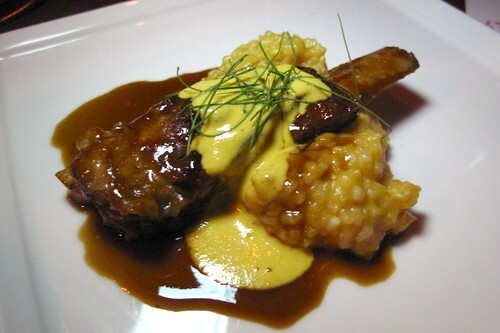 Glazed in a slightly sweet sauce, the shreds of meat blended into the creamy peruvian risotto. Each forkful was a delight. 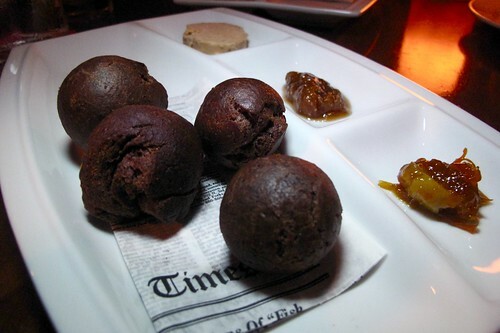 Dessert consisted of two warm, perfectly-fried nuggets of dough. 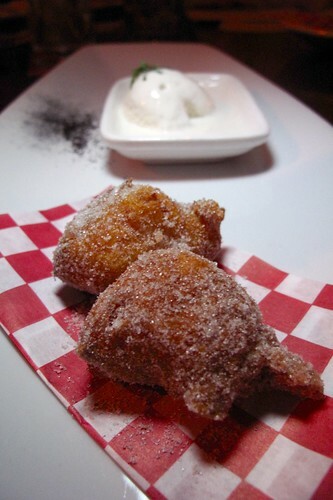 The subtly sweet fritters were tastiest when eaten with the ridiculously rich, house-made vanilla ice cream. Definitely my favorite meal at the TestKitchen thus far. we love his food too..great write up! One of the most diverse tastings I've seen in a while. Looks great! Yay for a good Test Kitchen experience!